Braves By The Numbers: Braves @ Rockies: Game 1 Recap aka "Deja Vu"
Didn't we do this already? Get down really early, check. Come back to tie the game, check. Take the lead, lose the lead, take the lead, lose the lead, check check check check. Bomb in the 11th, BIG CHECK! Yeah I'm pretty sure we just did this a couple games ago. Deja Vu for sure. 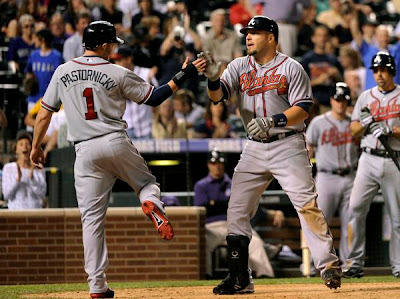 Only this time it wasn't Chipper Jones, but Eric Hinske with the extra innings jack that gave us the win. Not that Chipper didn't have his own homer in the game, and so did Freeman. If you didn't think it would be a long-ball-fest in Colorado, well, you obviously don't know Coors Field. Huddy was perfectly awful in the first inning. Part of that I will blame on Tim "Keyhole" McClelland whose strike zone is a postage stamp. Also it takes more time for Tim to make a strike call than it takes for Congress to pass a bill. I thought at one point Joe Simpson was going to lose his mind in the booth. Despite the tight zone, Huddy was elevating his pitches in the first, which meant all the walks came home to roost. Before you could sit down, turn around, and pick a bale of cotton we were down 5-0. In any other ballpark I probably would have started watching reruns of Family Guy. In Coors Field, I still felt like we had a chance. Do you like hits? Well the Braves had plenty. Freddy and Hinske had 4 a piece, while Bourn and Chipper each had 3 hits. Also we had plenty of action on the basepaths with Bourn swiping 2 bags and Heyward stealing one. However, the walk-off hero in Eric "Diesel" Hinske was the MVP of the game. Four hits, 3 RBIs (one with 2 outs), a double, and the game-winning long ball in the 11th. Hinske is only batting .412 on the season with a .559 slugging percentage. He's almost into dancing bobcat status per the illustrious Mr. Simpson. Give the Braves pitching staff a lot of credit. After the first inning, Huddy settled in and only gave up 2 more runs in 5 innings. Medlen continues to sparkle with 1.2 innings of no-run work. Eric O'Flaherty righted the ship only giving up one hit, and Durbin is turning things around over the last two appearances with some solid relief. The Rockies bullpen was equally as strong sending out 4 relievers in 4 innings before Hinske took Escalona yard. I think if you are a Rockies fan, you can probably question your manager for sending a stud like Betancourt out there for only 6 pitches, and then not keeping him in the game. We wore down their bullpen to their worst pitcher. That's the reason we won. When the dust cleared, we had a 9-8 extra innings win, with a dash of drama since Kimbrel doesn't like 1-2-3 innings when we have more than one run. He's a drama llama. Somebody tell him I don't need to be on the edge of my seat EVERY game. It's 162 a season. My heart needs a little break every now and then.